March 26, 2018 – Debu Tripathy, M.D. March 26, 2018 – MIKE HENNESSY, SR.
Oncologists explore neoadjuvant therapy, heated chemotherapy and PARP inhibitors to find the right treatment for women with ovarian cancer. 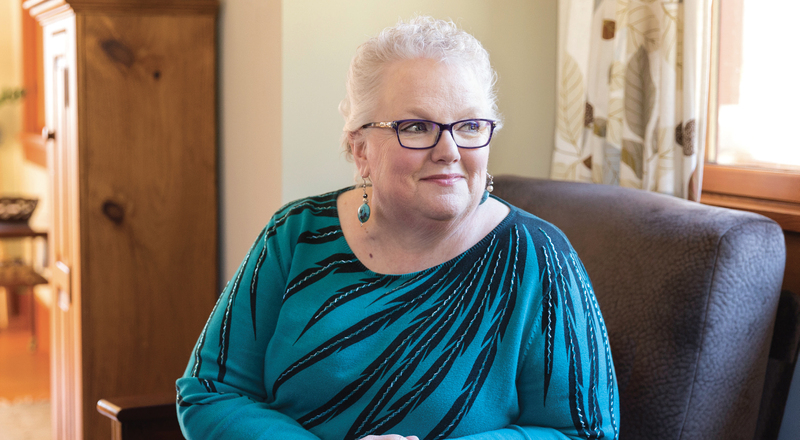 When Susan Baldridge, 62, saw her primary care doctor for some ongoing stomach issues, she never expected that a few days later, she would receive this diagnosis: stage 3c ovarian cancer. The emergency room physicians described the mass as typical of ovarian cancer and began working on Baldridge’s transfer to Inova Fairfax Hospital’s women’s clinic in West Falls Church, Virginia. There, she would receive more specialized treatment. Diagnosis of ovarian cancer tends to be late because the symptoms — bloating, pelvic or abdominal pain, feeling full quickly, urinary symptoms, fatigue, back pain and constipation — are vague and often do not occur until the disease has already spread, Herzog says. “The problem is, a lot of other conditions can cause those symptoms too,” he adds. Screening tests for ovarian cancer have not been as successful as mammography and colonoscopy, which can help detect breast and colon cancer, and there is no validated screening program for the general population. For those at increased risk, two tests are available: transvaginal ultrasound and the cancer antigen (CA) 125 blood test. A transvaginal ultrasound looks for masses in the uterus, fallopian tubes or ovaries, but it cannot distinguish between a cancerous or noncancerous mass. The blood test helps detect high levels of CA 125, a protein that is often elevated in women with ovarian cancer; however, other common health conditions also can cause CA 125 to rise. Because these tests are not very accurate, they can lead to many false alarms, especially with borderline CA 125 elevation, as well as missed cancers. Hereditary breast and ovarian cancer syndrome, associated with mutations in the genes BRCA1 and BRCA2, is linked with a high risk of breast and ovarian cancer. The two genes are responsible for most inherited ovarian cancers: 39 percent of women who inherit a BRCA1 mutation and 11 to 17 percent of women who inherit a BRCA2 mutation will develop ovarian cancer by age 70, according to the National Cancer Institute. Gutermuth’s genetic testing revealed that she was BRCA1-positive. In 2010, she had a prophylactic mastectomy to remove her breasts and reduce her risk of breast cancer. She also began monitoring her ovaries with ultrasound and checking her CA 125 levels every six months. “When the CA 125 levels increased, I met with my husband and family, and decided to go ahead and have a prophylactic oophorectomy with hysterectomy,” Gutermuth says. “When I woke up from that procedure, the doctor told me I had cancer everywhere.” She received a diagnosis of stage 3c disease. TURNING UP THE HEAT For most women with advanced ovarian cancer, treatment entails surgery. The goal is to treat, stage and remove, or debulk, as much of the tumor as possible. These procedures can be long and intensive, she adds, and often require three to seven days’ hospitalization. “It is aggressive, but we do it to be as sure as possible that we get as much of the disease out as we can,” Pothuri says. Before undergoing primary debulking surgery, both Gutermuth and Baldridge received chemotherapy, an approach called neoadjuvant therapy — a step to shrink a tumor before main treatment. The international CHORUS trial compared outcomes in women with suspected stage 3 or 4 ovarian cancer. They were randomly assigned to receive either primary surgery followed by six cycles of chemotherapy, or three cycles of primary chemotherapy followed by surgery and another three cycles of chemotherapy. Survival outcomes between the two groups were similar, but women who underwent primary chemotherapy experienced fewer serious postoperative side effects and deaths. Gutermuth also underwent neoadjuvant, or preoperative, chemotherapy, but after her procedure, she received hyperthermic intraperitoneal chemotherapy (HIPEC), also known as heated or hot chemotherapy. HIPEC is given as a single treatment in the operating room after all visible tumors are removed. The solution is heated to between 107.6 and 109.4 degrees Fahrenheit to kill any remaining cancer cells and preserve the healthy ones. It is delivered directly into the abdomen — making it ideal for a patient whose disease is confined to the body cavity — for about 90 minutes. Gutermuth spent one night in the intensive care unit and 12 days in the hospital. “The recovery was pretty intense but worth it,” she says. Because the procedure can be associated with major side effects, HIPEC is not widely used. Although data support potential clinical benefit, it remains uncertain if similar favorable outcomes would be observed with strategies that are considerably less likely to result in serious toxicity, Markman explains. Risks involved in HIPEC include bleeding, infection and, less commonly, blood clots in the legs. Because it can be challenging to consume enough calories as the digestive system recovers, patients may need to receive nutrition intravenously or through a feeding tube. Any residual scarring in the peritoneal cavity can result in chronic pain and altered bowel function. During a recent trip to Camp Mak-A-Dream, a retreat for cancer survivors in Gold Creek, Montana, Gutermuth was surprised to learn that of the 48 women she spoke with, just two had even heard of HIPEC. “I tried to talk to them about HIPEC and how incredible it was for me — it was lifesaving,” she says. Unfortunately, regardless of which initial treatment is selected, 70 to 90 percent of women diagnosed with advanced ovarian cancer have a recurrence, according to the Ovarian Cancer Research Fund Alliance. If the disease recurs within six months of chemotherapy, it is classified as platinumresistant; if it recurs after six months, it is platinum-sensitive. The disease’s classification may affect which additional treatments can be tried. After undergoing a second round of HIPEC for disease recurrence, Gutermuth is continuing maintenance treatment with Avastin (bevacizumab), a targeted agent designed to attack the blood vessels that grow and support the tumor. She receives infusions every three weeks and has regular scans every three months to make sure the disease has not returned. Avastin was first approved by the Food and Drug Administration (FDA) in 2014 in combination with chemotherapy for women with platinum-resistant recurrent epithelial ovarian cancer after a phase 3 clinical trial showed a 62 percent reduction in the risk of disease worsening or death compared with treatment with chemotherapy alone. In 2016, the FDA approved Avastin combined with chemotherapy for women with platinumsensitive disease. One of the newest, most exciting areas of development in targeted therapies has been PARP inhibitors, according to Pothuri. “These inhibitors work particularly well in women with BRCA-positive disease,” she says. The first PARP inhibitor, Lynparza (olaparib), was approved by the FDA in 2014 for patients with a BRCA mutation, who had been treated with three or more prior therapies. In these patients, Lynparza almost tripled the amount of time before their disease progressed. In August 2017, the FDA expanded the drug’s use to include maintenance treatment of patients who are in complete or partial response to platinum-based chemotherapy. In 2016, the FDA approved a second PARP inhibitor, Rubraca (rucaparib), for women with ovarian cancer with a germline or somatic BRCA mutation who had at least two prior therapies. The results of a clinical study of Rubraca showed that about 80 percent of women with a BRCA mutation responded to therapy. Most recently, in March 2017, the FDA approved Zejula (niraparib) for maintenance therapy in woman who have achieved complete or partial response to second-line treatment with a platinum-based chemotherapy, regardless of mutation status. A trial of Zejula showed that in women with BRCA-positive disease, the median time of progression- free survival was 21 months compared with just 5.5 months for placebo. “PARP inhibitors are exciting and are a nice addition to our treatment options for these women,” Herzog says.